Sometimes, I feel like all the brilliant friends I am fortunate to have, but perhaps don’t deserve, should be the ones writing this blog. My friend B very recently allowed me to share her Khao Na Gai recipe with you. Then a few weeks ago, my friend L showed me the only way he had been making perfect Thai sticky rice for the past several months. It’s done without a steamer. I’ve tried this method many times since then, mostly just to prove him a misguided heretic. But in the end, I, too, have willingly joined the cult of splatter guard. And the post I had written and kept in the draft folder on 5 ways to perfectly steam sticky rice has suddenly been rendered obsolete. Traditionally, Thai/Lao sticky rice is steamed in a cone-shaped woven bamboo basket (to achieve the soft-yet-chewy rice that they eat with their hand, the rice is not cooked in water but with steam), which is used together with a funny-looking aluminum pot, or an aluminum (sometimes stainless steel) multi-tiered/stackable steamer. Both methods work very well and have been used by the Thai people for ages. The equipment itself is also inexpensive and not that hard to find. However, the problem which some of us have with these traditional steamers is the lack of storage space. The bamboo basket-“spittoon” combo takes up quite a bit of cupboard or pantry space. While this is not necessarily a deal breaker, a uni-tasker that size can elicit resentment. Besides, in order to clean the bamboo basket, you need to soak it for hours to loosen up the sticky rice that has penetrated its every crevice. Then some scrubbing is still needed, followed by thorough drying of the basket on the dish rack to prevent molding since wiping it dry prior to storage just won’t do. The multi-tiered steamer, on the other hand, is not a uni-tasker. But it sure takes up a lot of storage space. To make sticky rice, it also requires either a heat-proof dish or a piece of cheesecloth with which to line the bottom of the steamer. Have you tried to get every single sticky rice kernel off a delicate piece of cheesecloth? My. Goodness. Sometimes, when I want to make just a cup of sticky rice for myself, the idea of dragging these big things out of the cupboard, putting them together, cleaning them, drying them, and putting them back in the cupboard is enough to make me go, “Ugh.” It’s like, as the Thai idiom goes, “riding on an elephant just to catch a grasshopper” (ขี่ช้างจับตั๊กแตน). Ditto with an electric steamer which had been my go-to method of steaming until now. Cleaning all the parts is a pain. But I have no choice. Steaming sticky rice in the microwave is unreliable due to varying wattages, and the method that one person swears by is often frustratingly useless to another. The collapsible steaming basket may not be taking up much space, but its pitifully short legs result in the rice being much too close to the boiling water causing the bottom parts to turn mushy. Also, since the water level can’t be higher than the space between the bottom of the basket and the bottom of the pot, the water often evaporates too soon and needs to be replenished and brought back to a boil periodically, especially if you cook a large amount of rice. That is a pain. Besides, that pole in the middle is just … awkward. Enter the handsome, sleek uni-tasker-turned-multi-tasker: the splatter guard. Chances are you already have one tucked away somewhere in your pantry. But if you don’t, its relatively low prices may convince you to get one. Though wide, a splatter guard is wafer-thin and can wedge itself very easily between the cookie sheets in your cupboard. The pot-splatter guard ensemble is also quick and easy to put together and take apart. And here’s the thing: it works so beautifully. At first, when L explained to me this unusual method, I kept thinking he was talking about a cheapo, MacGyver-ed “steamer” which under-equipped cooks resort to in the absence of a proper steamer. But L went on to rhapsodize the perfectly-cooked sticky rice he’d been getting from this steaming method. He cooks his sticky rice this way not because he doesn’t have a steamer; he cooks the rice this way because it yields better results. L had me convinced. And look what I’m writing now. Not only is the fine mesh perfect for regulating steam from below and eliminating hot spots (or wet spots), it is also ridiculously easy to clean. Sticky rice does not stick to the mesh screen at all. The rice is cooked evenly; the grains remain whole and never turn mushy; all grains cook at the same rate. Why, oh, why did I not know about this sooner? its dome shape seems to create an environment wherein sticky rice cooks more evenly. A tagine phenomenon going on here? Soak the rice for 2-3 hours (longer if the amount is larger and if your rice is an old crop which has lower moisture content) and drain it. 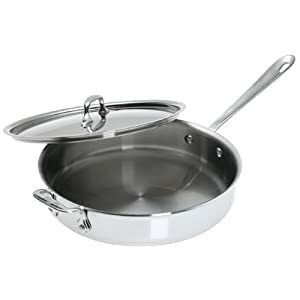 Place the splatter guard screen on top of the opening of a pot (or a sauté pan with straight sides as shown above) which is smaller than the circumference of the splatter screen. Fill the pot with water and start boiling it. The space between the water and the screen should be about 3 inches for best results. Once the water is boiling, adjust the heat so you maintain a gentle, instead of rapid, boil. Place the drained rice on the screen, right in the middle. It’s best to keep the rice mound no higher than 2-3 inches to ensure even and quick cooking. Cover the rice mound with a pot cover that domes up a bit higher than the height of the rice mound. The cover does not have to match the size of the pot opening; as long as it doesn’t touch the rice and can sit on the screen, it’s fine. The amount of steaming time depends on the amount of rice (with this method, one cup of raw rice should take 25-30 minutes). It would be good to flip the rice once half way through the steaming to ensure even cooking and prevent the bottom of the rice mound from getting too soggy. 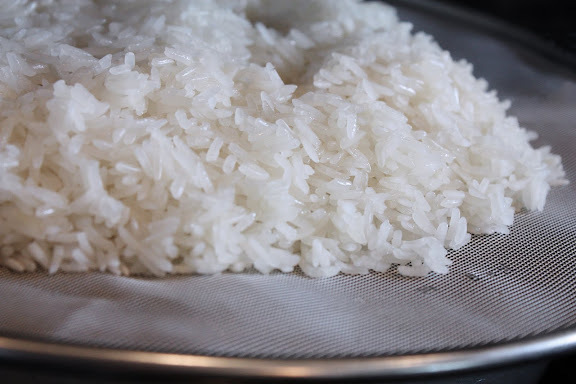 Once the rice is cooked, remove the splatter guard from the water and scrape the rice off the screen. The cooked rice should slide right off. This method works well with other easy steaming jobs as well. I’ve made beautiful Thai curried fish custard in banana leaf cups and many other things this way. You can also use a splatter screen to sift flour or play indoor badminton with, swat a fly in the kitchen, and, of course, as a splatter guard. I kind of resent our rice “spittoon”. Really, in the two years I’ve been with my boyfriend (he’s Thai), we have used it exactly once. ONCE! So it takes up a ton of space, we never use it, and our friends constantly try to wear the basket as a hat. I can’t wait to give this method a try. I know there’s no getting rid of the unitasker, but at least I won’t have to dig it out of storage if I want sticky rice. Mate, it works like a treat ! Why didn’t I think of that ??? Well done ! Great method. Thanks. Just used this splatter guard method for a meal for Japanese and Korean friends and they agreed it was 95% just like their mum’s cooking. Rinse any rice very thoroughly, believe it or not, rice is often high in arsenic! You can also use this method with slight alterations to make sweet sticky rice (ka niew moon). I also have the bamboo steamer and the big multi-tiered steamer because my mom makes Thai desserts, but whenever we make sticky rice it’s always the microwave way. Just as a warning, it is not a healthy idea to microwave plastic wrap! Interesting technique, Leela. For me, I always use the rice cooker. The new version can cook sticky rice very well. I don’t have to soak the rice before cooking. You mean the water for steaming not soaking, right? I think that’s the case, but wanted to be sure. I was asking thip water to rice ratio for rice cooker method. However tried your method and it work great. Thanks for the info. Ah, yes. Sorry, new replies don’t show up as replies to older comments on my end. I’m pretty sure when Thip says she cooks sticky rice in a rice cooker, she means she uses the steamer insert set on top of boiling water underneath and that newer rice cookers have this feature. Unlike other kinds of rice, Thai sticky rice is cooked with vapor. Great tip! I am due for a new basket and have been debating replacing it, but now I might not have to! An inverted stainless steel bowl would probably work really well for a lid, since most pot lids are not very deep. u know u could just saute the rice on low heat on oil add water and cover with top for 15 minutes(rice should still look uncooked) then cover again for another 15 mins until rice is ready. this is a much easier and cheaper process than getting all that steampot bamboo ridiculousness stuff. Akira Honda – Apparently, you’ve confused Thai/Lao sticky rice with other types of short grain sticky rice. To get a basic understanding of what Thai sticky rice is and how it must be cooked with vapor, read the post and the embedded links. Hi Leela, may i check ~ is this with normal rice or glutinous rice? Thanks! Space isn’t the main issue for me. It’s cleaning. We eat sticky rice fairly often, but I’ve made it Hubby’s task to clean it. He gets annoyed with me when I don’t soak the basket immediately after removing the rice. I’m interested to hear more about Thip’s method of cooking it in a rice pot. Wow…Another use for a splatter guard! I’ll have to remember this trick. I use 2 splatter guards onto top of each other to strain my soymilk, because it creates a quick filter that’s easy to clean. Since you need to flip, or turn, the rice while steaming I would recommend buying two splatter screens, making it easier to flip the rice over onto another screen and then continue cooking. They’re at the dollar store…get two! This method works great but the bamboo steamers allow for easier flipping. I never was too skilled at flipping or turning the rice, but now I am…using two splatter screens! Hmmm. I guess it doesn’t hurt to have two splatterguards, but I don’t necessarily see the need for that extra one. I’ve found the flipping part to be completely effortless. At half-way point, the rice has already formed a sticky mass that can be flipped easily in one go with a spatula, unless you make a very large batch (even so …). If the rice kernels are still separate, it’s not time to flip yet. I took an old splatter screen and cut it down to fit in the bamboo steamer. Works great with a Wok. A couple years ago I googled “how to make sticky rice” and found out it had to be steamed. I checked in my kitchen and found a splatter screen and used it as described in this post. I always found it hard to flip the rice. This is the reason today I googled again “how to make sticky rice” to find a better method and found this post. Two screens! Thanks! What a great idea – I can’t wait to try it. I generally find my splatter guard pretty useless, and it’s relegated to the back of the cupboard, but as it takes up so little space (particularly compared to a dedicated rice-cooker!) I’ll happily keep it if this works, fab! sorry for being so dense, but for say one cup of rice 20 minutes?? hugh – No apology necessary. No, jasmine is not the same as sticky/glutinous rice (this post may help). This method works only with sticky rice, but not regular long grain rice. You could cook long grain rice using this method, but 1. only in a small amount (no more than 3/4 cup raw), 2. in a heatproof container, and 3. with added water (1.5 times the amount of rice). I’ve never cooked jasmine rice this way as I have a rice cooker. But jasmine rice was steamed in a big steamer that way in many restaurants in Thailand 3-4 decades ago when commercial-sized electric rice cookers weren’t so widely available. So based on this, I’d think this method works, though I have never tried. I really appreciated the input. I am considering buying a splatter guard and now that I see that it has multiple uses, I just might consider buying one. 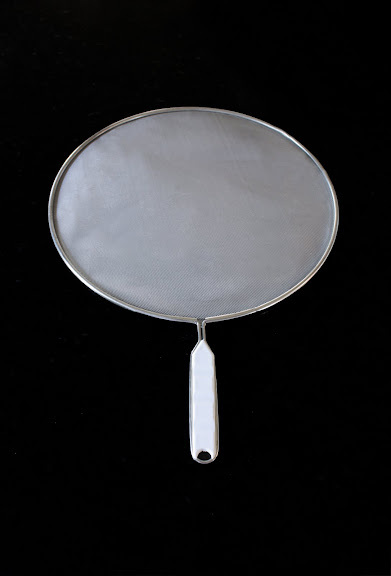 Besides making rice, covering frying, and using it as a sifter are there any other suggestions for this tool. Anon – Besides ride, can use it to steam other things as well: broccoli, steamed cupcakes, asparagus, etc. A friend of mine has one with stainless steel handle and she has used it to line a cookie sheet with when she runs out of parchment paper. The fine mesh is naturally nonstick and works almost like a Silpat, so anything chunky, like cookies or bread, that doesn’t fall through the holes, can be baked on it and will slide right off of the mesh once cooked. Mine, as seen in the pictures, is a cheapo one that comes with a plastic handle, so it won’t work in the oven. Long ago I used to have friends who made Sticky rice. Remembering it fondly, I have been attempting to prepare my own with limited success. So when searching the web, I found this article and I had to try it. However, on my first attempt, my rice turned out very sticky. Yes, it would stick in a clump but even more it would stick to my hands! I will keep experimenting (different rice, different quantity, cooking time, etc.) but is there a most likely reason for the cause of this? Douglas – Another reader just wrote me about his experience which is the exact opposite of yours, and that is his rice took a long time to cook and wouldn’t stick together. I’m quite positive that his rice is an old crop (lower moisture due to longer storage) and yours is a new crop (higher moisture). When you deal with different brads and different crops like this, it’s hard to specify the exact soaking and cooking time. Usually, the first batch is unlikely to turn out exactly as you want it. If your rice sticks to your hands because they’re too soft and wet, you’re indeed dealing with a new crop. In this case, reduce the soaking time by half and cook it just until there are no hard bits left in the rice kernels. But if your rice is fully cooked and not too wet or soft (i.e. the kernels hold their shape), yet sticks to your hands, er, excessively (? ), then it’s possible that it’s an old crop. In this case, either the rice is not cooked long enough or the splatter guard is too high above the water. Some people even say you have to soak old crops overnight for best results. (!!!) I’ve never soaked my rice, regardless of the moisture content, longer than 5-6 hours. But your mileage may vary. Leela – thank you for your response, so informative. When I was growing up in Minnesota, Asian food meant Chow Mein in a can and rice meant Minute Rice, with a bit of butter added so it wouldn’t stick together. It used to amaze me to think how dexterous Asians must have to be in order to eat a complete meal with chopsticks, one slippery rice kernel at a time. Fortunately I have become wiser as I aged. I still remember the seminal moment, seeing people eat at a restaurant in Chinatown, San Francisco. Suddenly, I understood… clumpy rice, little rice bowls to carry the food closer, using chopsticks like a fork instead of a pincer. To my amusement, I even felt some outrage. After my many abortive chopstick attempts, it seemed like cheating! However, the crop concept is a new aspect for me. I have always considered rice to be a fairly ageless commodity, not a crop, like fruit or potatoes, where freshness and storage noticeably affect taste and cooking. I will definitely try again. But first I think I will buy new rice. So how can I tell if I am purchasing “new crop” or “old crop”? (and how old is rice before it becomes old crop?) I have your rice label picture in my billfold so I can be sure to find “the right stuff”. But here in Minnesota we’re at the far, far end of the supply chain for Asian produce so there is no telling how long something has been in the warehouse. Success – I bought some new crop rice, soaked less, cooked less and it worked! Thank you! Douglas – As opposed to jasmine rice which almost always has crop information on the bag, glutinous/sticky rice packages infrequently do. It doesn’t matter, though. With each new bag, all it takes to figure out the moisture content is a small, sacrificial batch. Once you have a rough idea of what you’re dealing with, it’s easy. Then it’s just a matter of remembering that the longer that bag of rice sits in your pantry, the longer it needs to soak. This is revolutionary. I avoid sticky rice (making it) like the plague for all of the reasons you mentioned, despite loving it. My splatter guard is silicone with bigger holes, so I am guessing I need a mesh one, but as you say, no biggie space-wise. Thanks! What a great idea! As an American who’s been living in Bangkok for the last 3 1/2 yrs I eat Khao Niao (sometimes spelled Khao Neow) almost daily. Although buying a single serving from a street vendor is only 5 Baht, (about 2 cents) I cook it at home all the time. I was lucky enough to have learned how to cook it from Som, who hails from Isan where Khao Niao is a staple. The only problem is that quite a number of the grains fall through the holes of the aluminum steamer and wasting even a single grain of food isn’t the way my mother raised me. So behond the ease of cleanup, this method will prove to end waste which is the reason i will change my Khao Niao cooking modus operandi. As to the ‘stick to your fingers problem’, a great trick that my Northeastern Thai friend Som also taught me is to rub your scalp, [assuming one still has hair!] for a few seconds as the oil from ones hair will coat your fingertips and that prevents the rice from sticking. May look a tad weird, but it truly works! Uhm, unhygienic and off-putting to do the scalp/hair thing. How about rubbing a little cooking oil on your hands? My mother taught me to stir into the steamed rice oil in which garlic had been lightly browned — the aroma and taste are heavenly! You rock! This is exactly the cooking tip I needed for my Khao Nieow Ma-muang success. Kop khun maak kha! Tried this tonight! It was awesome and SO EASY!! OneWildMango – Thanks for the report! what would be the difference between thai sticky rice cooked with the splatter guard vs. in my rice cooker? would i need to presoak the rice prior to cooking in the rice cooker as well? do they come out tasting differently? Sticky rice is supposed to be steamed dry, i.e. unlike jasmine or other long grain rice which is cooked along with the liquid, sticky rice should only be cooked by the vapor from boiling water. So to steam sticky rice in a rice cooker, you can’t use the same method you use when cooking other types of rice (add water to the rice, push the button, and wait for it to go ‘ding’). That will result in wet, gooey, and pasty sticky rice. For best result, you need to use the steamer insert that hopefully comes with your rice cooker. And, yes, you also have to soak the sticky rice beforehand. This worked out fabulously for me! I don’t cook sticky rice very often and so this was the first time it turned out perfectly. My rice was very old (more than a year old) so I soaked it for about 24 hours. For 2.25 cups of glutinous rice, it took about 40 minutes to steam over a large sauté pan with 3″ high sides (I used about 1/2″ of water). And clean up really was so easy. Thank you!! Anon – Jasmine rice and sticky/glutinous rice (which is what this recipe/method is for) are totally different types of rice. Jasmine needs to be cooked in water. This method won’t work with jasmine. -Use a metal, fine mesh colander that fits over a pot of boiling water. Colander bottom should be above water line by 2-3 inches. -Cook normally. No cheesecloth required because you can pick up the colander handles and give it a good toss, shake, shimmy … for even cooking. It essentially looks like the traditional bamboo basket over vase-looking pot, only modernized. Easy to clean and a bit more sanitary than the oil splatter guard. I’m Vietnamese and I like to make savory rice. I toss in scallion oil, along with other condiments into the rice while it’s still in the mesh colander which makes the effort such a breeze. Hope this helps ^_^ !! Does it work with silicon splatter guard? I have read some reviews that stainless steel splatter guard is not that reliable. Genevieve – I have no idea. I don’t have a silicone splatter guard and nobody has reported back here yet whether that works. Would you like to volunteer? 🙂 People who follow this post will find your report very helpful. Thanks. Haven’t tried this yet, but looks really interesting. I have the spitoon/basket that I use in my Denver house, but my apartment in Bangkok is tiny and my kitchen pretty basic. A helpful hint if you’re steaming sticky rice, regardless of method…for larger batches, instead of a simple mound of rice, stick you finger into the mound of raw, soaked rice and create a doughnut hole of sorts. the steam can penetrate from the center also, helping ensure there’s no undercooked grains in the middle. Works great in my basket & should really work well on the spatter guard. Mike – I never knew that. Thank you for such a great tip! Cool, thanks for the idea! Leela, cannot thank you enough for posting this method. I made sticky rice last night and it was delicious! I also used Mike’s tip to make a hole in the center of my mound of rice and I think that’s a great idea to evenly steam the rice. Making it again tonight and this time i’ve been soaking the rice in cold water overnight, so i’ve expecting spectacular results…many many thanks to you and L! So excited to try this! How long do you steam it? Are we talking 5 minutes or 20? The article didn’t specify. David – The length of time can’t be specified because it depends on the amount of rice you’re cooking (and how long you soak it for). I’d say, in general, it should take about 15-20 minutes to cook one cup of raw sticky rice which has been soaked 4-5 hours. I have worked in Laos and continue to make stickyrice once a week at least for the last 5 years. This article is great and it works. Keep the times about the same as how you would cook in a bamboo basket. If your rice is too sticky its overcooked. Rule of thumb for me is a rice pile about 6 inches in diameter and 5 inches tall, cook 15 mins, flip it over and cook another 15. My enchantment continues! This is HUGE!! I’m so overstocked with One Trick Pony kitchen things, that I need this recipe!! I love sticky rice, but it’s kind of difficult *until now* to do the old fashioned way if you don’t have the cone! I’m overjoyed and off to read your other posts! Wow!!! This was my first time cooking sticky rice and the splatter guard worked like a charm! Used Mike’s trick and made a hole in the middle. FABULOUS! OMGosh! Perfect, translucent single sticky grains that don’t stick to my fingers, but stick to one another! I used the spatter guard, and since I was only making a small amount of rice, I used Mike’s doughnut technique and steamed it for about 20 minutes. Somewhere I read how to tell if the rice had soaked enough…remove a grain from the water and bite it. It should yield and collapse into a chalky powder. Therefore, my rice is fairly new crop because it only took an hour and a half soaking time. Doesn’t matter…what shade of lipstick do you like on your shoes? Bless you for this solution!!! Fab Idea! I do have a question though…. does one still have to soak the rice first? Anon – Yes. And, as I’ve pointed out in the post, the length of time depends on how old your rice is. If I just go and buy rice at the store, how will I know if it is new or old crop? Also, would this method work to steam dumplings?? Anon – Some brands put that information on the bag; many don’t in which case your first batch will be an experiment. I’d soak the rice for two hours with room temp water. If that’s enough to yield tender cooked rice, then you’ve got a new crop. If not, next time, soak the rice longer. Keep in mind, though, that even if you end up with a new crop, after long storage (over 6 months), the new crop will start to behave like an old crop too. This method works with dumplings. I’d be most grateful for some guidelines for steaming times for, say, 1 cup and 2 cups of soaked rice. Also some rice brands and style recommendations would be appreciated, thanks. danny6114 – I’d say 15-20 for one cup soaked rice and ~30 for two cups soaked rice. If it takes longer than this, your raw rice isn’t soaked long enough. My kid has been doing microwave rice for years. I expect it would work for sticky rice as well. The basic formula is this – yu will need to work out times and amount of water depending on your MW and your rice. 1) Put rice in MW safe bowl. 2) And “normal” amount of water. 3) Bring to boil at full power. 4) cut back power to ~50% so that water boils but does not boil over. 5) Continue until done. About the same as steamer time. BYD – That wouldn’t work for Thai sticky rice which needs to be cooked with vapor not water like regular long grain rice. I mean, you can cook sticky rice in water, but it won’t result in the kind of sticky rice consumed in Thailand. 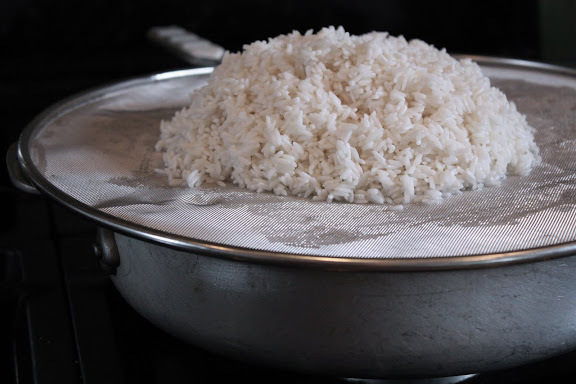 Likewise, long grain rice will not cook properly using the traditional sticky rice steamer or this splatter guard method either as it needs to be cooked in water. This is brilliant. All I need is a spatter guard. This is brilliant. I’ve tried all the methods, and usually pull out the basket and spittoon. I’ll try it this way next time. I do use the spittoon for steaming other things though, so although it takes up a lot of space, it’s not for nothing. I found a splatter guard at the grocery store across the street. Now I just need to get the sticky rice and give this technique a try. But one question: I don’t understand your instruction: “It would be good to flip the rice once half way through the steaming.” Can you describe how I might accomplish this? I love mango and sweet sticky rice, which I’ve eaten in restaurants but would love to make at home. Is sweet sticky rice a different variety or is it simply regular sticky rice with sweetener added? Could it be cooked the same way? When partially cooked, sticky rice kernels stick together and form one big lump of rice. You flip it like you do a pancake, with a larger spatula. If you’ve never cooked sticky rice before, it may be difficult to visualize this. But you’ll see once you’ve got the process going. I must emphasize that the kind of sticky rice mentioned here (it’s the same rice used to make Thai coconut sticky rice and mango) is drastically different and not at all interchangeable with other types of short-grain, “sticky” rice used in European or East Asian cuisines (see this post on what kind of rice is Thai sticky rice?). This is long grain glutinous rice which is not cooked in water but with vapor. If you use the wrong type of sticky rice, this method will fail you. The rice is not intrinsically sweet, and steamed sticky rice is eaten with savory dishes. To turn it into a dessert such as sweet sticky rice and mango, you need to add sugar to it. See my recipe here. By the way, white nectarines are very sweet right now here in California and taste awesome as a mango replacement in “mango sticky rice”. The americans here should give it a shot! You can turn the sushi rice into a wetter, more rice pudding-like version. I’ve linked to the recipe I’ve written for Serious Eats on my Thai coconut sticky rice post: http://shesimmers.com/2009/03/mango-and-sweet-coconut-sticky-rice.html (scroll down to the bottom). By the way — and I’m sure you know this already — sushi rice needs to be cooked in water. This splatter guard method onky works for rice that is cooked with vapor, i.e. Thai sticky rice. No, you’ll have to follow a different recipe for a different dish which I’ve linked to from that post: http://www.seriouseats.com/recipes/2012/04/thai-inspired-coconut-pandan-rice-pudding-wit.html It’s the only way to make sushi rice work in this situation, i.e. turning it into a rice pudding dessert. 1st of all, thank you for this wonderful post, I will be trying it in the very near future. 2nd, and the main reason for my reply, is “thank you” for answering just about everyone’s questions. You have been very attentive to the comments and in doing so have added another blog post’s worth of knowledge to your readers’ sticky rice arsenals! That says a lot about you (in a good way, of course). Even though Thai is not a cuisine I am very familiar with, I will probably stick around and catch up on a lot of your posts because of your passion for your subject. God bless you, Leela! Thanks, Bill. Knowing you’ve found this helpful makes it all worthwhile. I tried this out and it worked great! The first try I didn’t soak the rice long enough (3 hours). Second try it came out perfect after 10 hours soaking. I am going to make some more tonight, this one has been soaking for 58 when I finally cook it, so I’m a little worried it will be over-soaked…started it soaking saturday but then went out instead. anything I should do to help it come out right? You’re definitely dealing with an old crop, if you have to soak the rice longer than 3 hours. So for this batch, I wouldn’t worry about it being over-hydrated. The worst thing that could happen is that some of the kernels are broken. Simply steam the rice as usual, be careful not to stir or move it around too much, and be more mindful of the cooking time — it may not need to be cooked that long. I am really nutrition conscious so I love to make fresh Asian food and have always wanted to make sticky rice. So today, I thought to look up how to make it. This is the first Google result I looked at and am extremely anxious to try this method. When I saw that it was a splatter screen to be used, I said to myself “I have one of those”. My question is this, what is the best rice to use. I know what I have is old… so I’ll need to get more. Thanks for any feedback. Rich, as long as it’s Thai sticky rice (and absolutely nothing else), this method will work for you — doesn’t matter if your rice is old or new. First step, therefore, is to make sure that what you have indeed Thai sticky rice which is cooked with vapor not in water like other types of rice. Different types of short grain Japanese, Korean, Chinese rice is also generally called “sticky rice,” but those are not in view here. This is a revelation to me as I thought the long soak time was for sushi rice not sticky rice. I have a splatter guard and will give this a go. Bye. I’m so glad I ran across this blog in my search of cooking sticky rice. I am definately going to try the spatter guard method. I’m wondering if a glass bowl dome cover will work instead of stainless steel? I’m interested in making Vietnamese sticky rice, do you have any recommendation as to what type of rice would work best? You’ve mentioned sticky rice & glutinious rice in the blog are these two in the same? Will Japnese sweet rice work? There is no substitute for this. Short grain Japanese (Korean, Italian, Chinese, etc.) rice is different, needs to be cooked in water instead of vapor, and is never used in traditional Thai cooking or referred to by the Thai as sticky rice. I would worry about the weight of the glass bowl. the best tip i have ever read on here. it worked very very well and i am so relieved. i always worried about how am i going to steam this time. tried many ways and this is the best. try it everyone. Thank you for sharing this wonderful method for fixing sticky rice! I had forgotten why I quit making sticky rice until you reminded me of the chore of washing the rice off the bamboo — even when I used a cheesecloth between the rice and bamboo — and I NEVER want to eat or drink ANYTHING from a microwave. There is a very good reason they are outlawed in Russia. If you care about the health of yourself or your family, use it for storage but never turn it on again! Hi there Leela! I’m making fermented sticky rice wine with short grain sticky rice, I suppose its Chinese? And the recipe I’m looking at says to steam it in a rice steamer of which I of course have none just like most of us here and I’m wondering what your thoughts are on steaming it either your way or some other genius contraption you might have in mind. Thanks a bunch in advance! Jasmine, I have made the Southeast Asian version of fermented sticky rice many, many times by steaming my sticky rice this way. It can be done. Go for it. I also have a pan which is less than straight at the edges, how much does that matter?? As long as the splatter guard can rest on it and you keep the diameter of the rice mound smaller than that of the bottom of the pan, you’re fine. Thanks for the informative post. Just what I needed for my current culinary explorations. Made me giggle since my husband also calls it a “spittoon”. I placed cheesecloth inside the basket to ease the cleanup, sprayed it with non-stick also. Will be making next batch using the splatter guard method. Great work-around. Really late to the party but this method worked FANTASTIC! Just as good as the local Thai restaurant if I do say so myself. Thanks for the tip. I don’t get why some people have a hard time flipping the rice. I don’t find it to be difficult at all. It’s just a couple of flips with a spatula. I wouldn’t want people to feel like they HAVE to buy two splatter guards in order for this method to work for them. Some of us (quite a few if you read the older comments) don’t need to do that. How long do you steam for? It only says time varies but gives no time for the amount above. I didn’t give the time, because I didn’t specify the amount of rice either. I don’t remember exactly how much rice I used to make that batch, but I think it was about one cup of raw rice. I think it took about 15-20 minutes. Oh my, I did no research before soaking my glutinous rice and boiling it in a pot as it got wetter and mushier and horrible. Utter despair. I then decided to steam it using the regular bamboo steamer which you put dim sum in (random I know but its all I had at home). I put that over a pot of boiling water, popped the lid on and I had PERFECT sticky rice. I must admit, a few did fall through the rather large holes but now that I have discovered this method, I’m off to buy a splatter guard. I love sticky rice and thai food. Hi. I’m wondering if anyone has tried using the spatter screen for making fresh rice noodles? I’ve been struggling with learning to make these, and this seems like it could work well if the holes on the screen weren’t too large. Tonight I made sticky rice, steamed inside a pressure cooker. It was the best sticky rice I made so far. Usually I steam mine in an electric steamer. Often the bottom is wet and the top dry…this time the grains were translucent not wet but perfectly cooked, I don’t know if it a perfect sticky rice to Thai standards but it tasted very good to me. Since not all pressure cookers are created equal, for anybody interested I’ll say that I used a Kuhn Rikon, with at least 1 Liter water inside and the rice was in a terrine mold, uncovered on top of a trivet. And I have an induction hob, so it goes into pressure very quickly. 10 minutes total, since it went into pressure. That’s interesting, Francesca. I’ll have to try that method. Discovered your site today – GREAT idea using splatter guard! 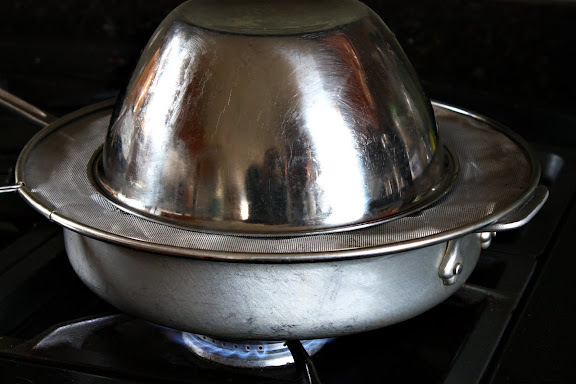 Has anyone thought of maybe cutting out a circle from the guard to fit inside a regular american-style steam double-pot? I’m thinking my small 3-tier steamer from Aldi’s might work with that addition to keep the rice from falling thru the extra-large holes. I’ve read most of the posts and haven’t seen an answer to my question. I’m soaking my rice now and plan to cook it shortly. Went to the store thsi morning and bought the only splatter screen they had. It had an odor adsorbing filter. They describe it as acarbon filter. It looks like to screens with the carbon filter in the middle. Any thoughts on this? I’m anxious to try it so hope there is some positive thoughts but somehow I’m not thinkings it’s the best idea. I thought I share my method of cooking the sticky rice here. I have been using the rice cooker to cook my sticky rice for a long time now. I cook it get the same way as I do with the jasmine rice, except that I use a ratio of 1:1 for the water and rice instead of the 3:2 for jasmine rice. I don’t even bother with soaking the rice first but if you do it does make it tastes a little bit sweeter. Have you heard of steam oven? I think its quite new. I’m not quite sure. I live in Asia so such hi tech cooking gadger may not apply much fr us but I have been wondering if you can make sticky rice/glutanious rice in there or any form of traditional asian (malay/chinese/thai/etc) recipes that requires steaming via using bamboo/metal steamers. nuri – Yes, I have heard of it. But since I don’t have one, or know anyone who does, I don’t know if it works with Thai sticky rice. Interesting, though, and I’m curious to find out. I saw in you tube of cooking rice using steam oven. But its an commercial oven for restaurants/business. Coz its huge. They just put the rice and water and steam it in a rectangular deep dish pan. Asia have many food/desserts recipes that uses steaming method. So its a pity that althou they(the europens/westerners to invented steam oven) say can cook grains in steam oven, they couldn’t show how to cook the variety of asian desserts. I am so happy to say that I used L’s splatter guard technique to make long sweet rice AND IT WORKED LIKE A CHARM!!! I only bought the rice because I saw a sweet little ol’ gal buy it. When I got home and looked up the type of rice I was worried I’d be stuck with no way to cook it. Thanks so much for sharing L’s cooking method. I’ve tried to make the sticky rice with the splatter guard method. I put in 1 cup of sticky rice and made sure there’s 3 inches between the water and the splatter guard. The mound is no higher than 3 inches too. While cooking it for around 5 minutes, I thought it was done because I lifted the bowl to check the progress. It tastes hard, and not sticky. Nothing like the sticky rice I had in Thailand. What am I doing wrong? Maybe I didnt let the sticky rice cook long enough? Or maybe was it too short? Joe – The splatter guard method instructions suggest at least 25 minutes for one cup of rice. The instructions on the mango-sticky rice recipe also explain in detail on how to tell when the rice is ready. There’s nothing that says remove the rice from heat after 5 minutes. Try again. Leela, thanks for pointing it out. I didnt read carefully and being a first time cook…well I never cook anything of significant like this except normal rice or instant noodles. I remember my aunt cook sticky rice with a stack of steamers…it was very time consuming. After cooking it she pour coconut milk and over it then sprinkle nuts…im not sure whats the name of these nuts. They are small and black. I guess different style because i ate sticky rice in krungthep and they dont use nuts. This is such in innovative, easy and cheap way to make sticky rice. I’ve loved sticky rice for years, but making it was just too complicated and time consuming. I’m so glad I came across this website. First try out of the gate and it was a huge success! I’ve made it about a half dozen times since and it always works…….I’ll never have to order it at restaurants again and I can now eat until my heart is content. Thank you, thank you, thank you!!! This is fantastic information. I love sticky rice, but always hated the bamboo cone coated with “sticky rice”..usually threw the cone out after 2-3 uses and got a new one. Only down side will likely be the weight I gain from eating tons of sticky rice. Thanks. New to the site and have tried a couple of recipes which turned out perfect. Your way is definitely what we would of done if we didn’t have a pressure cooker already. The original method as stated earlier takes up so much room. Having tried the method suggested here without success, I came up with what I think is an easier, foolproof way to cook the sticky rice. For 2 restaurant-sized bowl servings, use slightly less than 1 cup Thai sticky rice. Rinse thoroughly then soak overnight in twice as much water by volume than the rice. Drain water from rice in a sieve, then place rice in a 2-quart microwave safe covered dish of glass, ceramic or Pyrex. Add three quarters cup of water and cover dish. Microwave on high for 5 minutes, then microwave on Power Level 4 for 12 minutes. Allow rice to sit in covered dish for 5-10 minutes after removing from microwave. Makes a lovely, moist sticky rice with minimal utensils and no hassle. I am a big fan of mango sticky rice and have always dreaded making the rice portion. It has always been a mystery and short of buying the bamboo steamer cone contraption, I felt like it was undoable. I used to steam the rice wrapped in cheesecloth, in a steam basket and it worked very well but like you said, it was a pain to clean and you had to keep throwing away the cloths. When I came across this solution, I was very impressed at it’s ingenuity. I tried it twice this week and both times resulted in very mediocre results. I think the only thing I could have improved on is to get a different sized pot and metal bowl. You want them to be as close in diameter as possible to trap as much steam as possible. This is more challenging, for me, because my splatter guard has three ridges which act as stands so when you put the guard on your counter, oil doesn’t immediately spread all over it. The upside is it sort of works and yes, it’s very easy to get the rice off and clean the screen. I wonder if could get a piece of cheap food-save mesh material that i can just put in a steamer basket and have the rice sit on to of that? – I wanted to steam the rice as it is supposed to be. – I thought the splatter guard was an awesome idea, but still needed the proper hardware to match, to make the steam and cover. The steam basket has holes which would let the rice fall through, but here comes the splat guard: I got one of those, cut the handle off and I will use the round mesh grill as a liner to the steam basket. My sticky rice will be contained in the basket and properly steamed, everything goes in the dishwasher, and I can use my rice cooker for other rices too. i m on my way to get a splatter guard now….. This worked excellent for me. Just wanted to mention, have caution checking the rice when lifting the bowl. I burned my hand pretty bad when a big puff of steam escaped. This is genius! I just did it and it totally worked, and not a single kernel stuck. Mind BLOWN. Hi, thanks so much for this recipe, it comes out perfectly every time. One question; I’ve seen black glutinous rice in the shop, would it cook this way too? Nia – Yes it does, but the process takes too long. Not my preferred method. Online, I accidentally bought both red and white sweet rice. It was for a recipe which asked to boil the glutinous rice by absorption. I only tried the white rice but it comes out as glug. I shall try with the splatter guard. Thanks for the tip. Can I cook red sweet rice as you say above for white sweet rice? rice is new or old when I buy it ? Lori – You can’t unless it says so on the package. The first batch will always be an experiment in terms of how long to soak it. I’d say 3-4 hours should be safe.